Snap up this exclusive deal on Samsung's 2018 flagship phone. We've seen quite a few great Black Friday deals on smartphones this year, but this one beats them all. 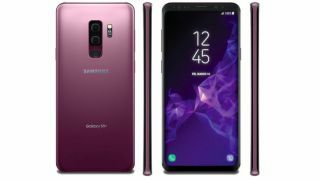 The Samsung Galaxy S9 is one of the best camera phones on the market right now, and this exclusive offer from Mobiles.co.uk takes the total cost for two whole years down to just £606, which is an incredible deal. So good, in fact, there are only a limited number on offer – so you'll want to snap this up fast. Here's what you need to know. The upfront cost for the Galaxy S9 handset is usually £199, but pop in the TECH49 discount code to drop that down to £150. Then you'll pay just £19 per month, for 4GB of data (on the UK's fastest 4G network, EE) and unlimited texts and calls. Want it now? Next day delivery is included. This is quite simply the cheapest price we've ever seen for 4GB of data on the Samsung S9 – one of the best camera phones around. There's a limited number available, so snap it up now. For designers and other creatives, having a trusted way to record an idea when inspiration strikes is vital. Nowadays that tends to comes in the form of a smart device, with a camera and note-taking services. But good smartphones don't come cheap, which is why we're so excited about this deal. But why should you choose a Galaxy S9 over other leading smartphones? Phone choice is a very personal thing, and being a (usually loyal) Android or Apple user will obviously have an impact on your decision. But if you are a die-hard Android fan, or thinking of making the switch, this is the deal for you. Not only is the Galaxy S9 is the most powerful Android phone available, it has a plethora of features just waiting to help you unleash your creativity. As well as a top-notch camera, the Galaxy S9 also has a flawless screen, which utilises Super AMOLED technology to deliver phenomenal image quality. If it's the upfront cost that's putting you off, how about this. The total two year spend is a tenner more than that EE mega deal above, but you only pay £64.99 off the bat. Need more data? Head to Affordable Mobiles for 20GB, plus unlimited minutes and texts, for just £31 a month on EE. And you won't have to pay anything upfront.